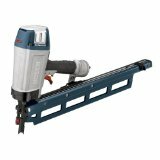 Bosch Tools has updated their site with July being the release date for their new line of Nailers and Compressors, and it turns out that their Framing Nailers are available now (probably depending on the store). I also wanted to see if Amazon had the new tools listed, and to my luck they are. Amazon has all the prices listed, and all the tools are available for pre-order. What surprises me is the price for these new tools. They are pretty much right on par or cheaper then other high end nailers. I hope this doesn't mean they chose to manufacture these in China, or skimp in any other way.